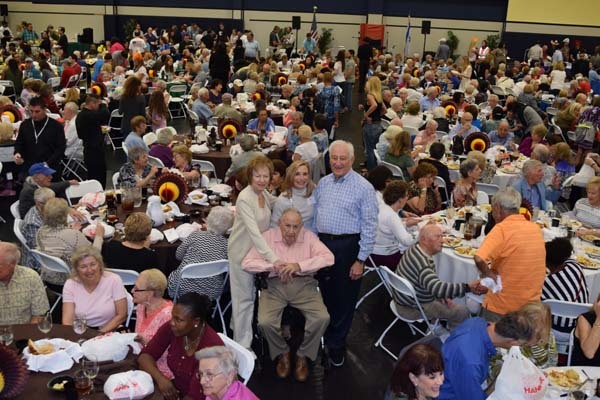 November 28, 2016 (Boca Raton, FL) - Ruth & Norman Rales Jewish Family Services (JFS) in partnership with Adolph & Rose Levis Jewish Community Center (Levis JCC) warmly welcomed over 700 local residents, who would otherwise have been alone, to enjoy a festive Thanksgiving meal. The annual banquet, generously sponsored by Edith & Martin Stein and Etta & Raymond Zimmerman, included a luncheon with sufficient food to provide attendees with a take home portion for another meal served by volunteers and goody bags for each guest. Over 300 volunteers assisted in making this event happen. For more information on JFS’ Food & Financial Assistance Programs like Meals on Wheels or JFS’ Senior Services Programs please contact 561.852.3333 or info@ralesjfs.org. Ruth & Norman Rales Jewish Family Services (JFS) provides help, hope and humanity through a comprehensive range of programs and services which support people of all ages and beliefs. With locations in Boca Raton and Delray Beach, JFS programs and services include food and financial assistance, senior services, career and employment services, counseling and mental health services and many volunteer opportunities. Funding is provided by private and corporate support, grants, special events and individuals who reach thousands in need each year. For more information about JFS volunteer opportunities and services for seniors, contact 561-852-3333. Learn more at www.ralesjfs.org .